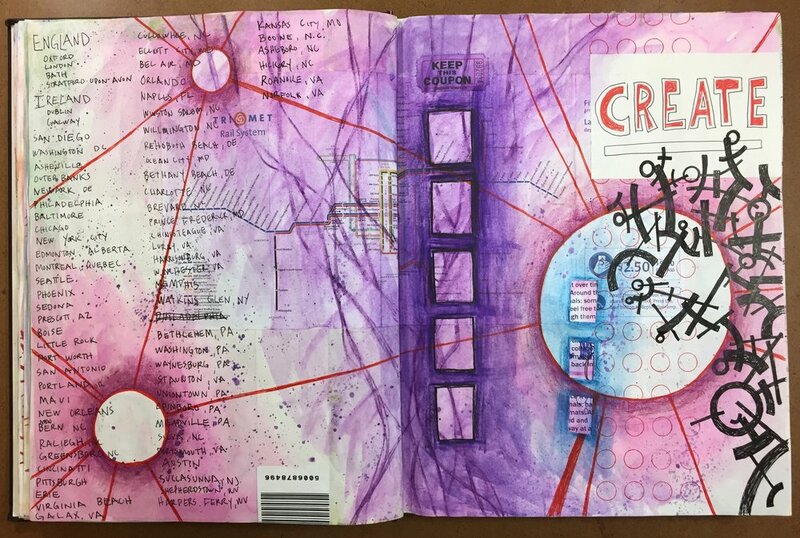 If you keep a sketchbook, art journal, or visual journal, you might be very picky about the book that you use, and choosing a book can be a very personal choice. I know that I am rather particular about the books that I use. Some artists prefer to make their own, controlling every aspect from how big it is to the type of paper used, and others use any book that they have on hand. But for me, I like to use a manufactured book that I can buy at the store or online. I like the consistency, and I like being able to simply grab a new book when I’m ready to start a new one. I admire those who hand-make their books, but it’s just not for me. For years I used hardbound Cachet Classic Sketchbooks, but at some point I noticed a change in the quality. Where materials barely bled through in my older journals, I noticed that ink and watercolor would bleed through some of the newer ones, so I switched to the Strathmore Hardbound Drawing Journal. It had a thicker drawing paper, and I used these books for a few years. But over time it has gotten more difficult to get them, and my favorite retailers don’t seem to carry them. So for my current journal, I’m using a Strathmore Hardbound Sketch Journal, and it is been serving me well over the past year. This book contains 192 pages of 60 lbs. (89 gms) heavyweight sketch paper, and though it’s intended for dry media, it holds up well to my mixed media approach with minimal bleed through. I’ve almost filled it, and I have another one waiting in the wings. Unfortunately, it’s getting more difficult to find these at retailers as well, but luckily, I have a stash of them to use over the next couple of years. I chose the Strathmore Hardbound Sketch Journal for several reasons. First, it’s one of the few hardbound books that comes in an 11 inch by 14 inch size. I’m not a fan of spiral bound books, since I like to create a lot of two-page spreads and a spiral just gets in the way. I also, really enjoy the larger format, and many manufactures make books no bigger than 8.5 x 11 inches. The bigger book challenges this standard size that we’re so use to, and it allows for more expansive opportunities when adding to the pages. There’s just more room to explore. Second it has 192 pages. I really liked the Strathmore Drawing Journal, but it only had 96 pages because of the heavier paper. It’s nice to have a book with lots of pages. Finally, the sketch journal has good quality paper. It’s part of Strathmore’s 400 series which they call their best. Yes, it’s on the thin side and meant for dry materials, but there’s not a whole lot of bleed through, even with watercolor and ink. There can be some, but I accept it as part of the process and a trade off for having the number of pages that I want. The thin paper is the only drawback that I see. Some artists can’t stand even the slightest bleed through, and colors coming through from the other side of the page can drive them crazy. Also, there is a lot of buckling with the paper when using watercolor or water-soluble materials. Again, that can drive some folks nuts because they want the paper to stay flat and unaffected by water. Like I said before, I accept these things as part of the process, and it doesn’t bother me. Besides, the pages flatten out pretty well when the book is closed. All in all, I am very pleased with the Strathmore Hardbound Sketch Journal, and it’s comparable in price to other hardbound sketchbooks. If you can find it, it’s a great book to work in as you journal.